When you say Baroque music, the name Bach must come up. He is one of, if not the most, influential person in classical music with his musical inventions, techniques and great compositions. Without Johann Sebastian Bach, it is doubtful, in my opinion, that classical music would have developed as fully as it did. Most of the great composers in the Classical and Romantic Era's to follow [and even with children learning how to play classical music today] got their foundation from Bach's musical inventions. Bach was a virtuoso organist whose upbringing in religion and deep faith led him to compose much sacred music for organ and for choral works. Bach had a fairly long life [for that period of time] of 65 years and he used this blessing by God to be a prolific composer of some of that greatest music ever written. He was a composer of cantatas and oratorios and many organ pieces and other keyboard pieces [mainly for harpsichord] and he was also an orchestral composer of concertos for violin and keyboard [that some have been transformed for the modern piano] and of orchestral suites and dances, and also of many great chamber music compositions. From Wikipedia: Bach's famous instructive 'Well Tempered Clavier' for keyboard [at the time - harpsichord] "consists of Books 1 and 2 with each book containing a prelude and fugue in each of the 24 major and minor keys in chromatic order from C major to B minor." Bach's 'Goldberg Variations' for keyboard is "an aria with 30 variations" with an "unconventional structure: the variations build on the bass line of the aria, rather than its melody." Make no doubt about it, when one talks about the giants in classical music, J.S. Bach must be mentioned right near the top. Along with Mozart and Beethoven, Bach fills my list of my top 3 composers. 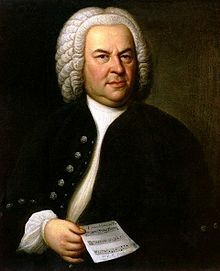 Bach was the main developer of the polyphony technique that was a main characteristic in the Baroque period of music. Polyphony means 'many voices' and in the compositions was demonstrated by different thematic lines [voices] of music being played at the same time [and/or sometimes the same melodic line being played but coming in at different points and not being played together-think "row, row, row your boat"]. One of the great examples of this polyphonic technique can be found in Bach's genius composition for organ, 'Toccata and Fugue in D minor'. Listen from 2:57 on in the following video to hear 2 and then more voices [lines] being played at the same time. To honor Johann Sebastian Bach's birthday, please turn up the volume and enjoy some more great music from the quintessential Baroque composer. HAPPY 334th BIRTHDAY JOHANN SEBASTIAN BACH!